As the best place for photographing the panoramic view of the Forbidden City, Jingshan Park is located at the center of the north-south axis of Beijing City. It is adjacent to the Forbidden City in the south, the Beihai Park in the west, and the Drum Tower to the north. It was once the highest point at the heart of Beijing. Jingshan is the imperial court of the Yuan, Ming and Qing dynasties. The mountain in the park has been renamed many times: Qingshan, Longevity, Zhenshan, Jingshan, etc. The folks used to call it the Coal Mountain. Located in No. 44, Jinshanxi Street, Xicheng District, Beijing, Jingshan Park offers a ginkgo garden, a cherry-apple trees garden, a peony garden, a peach orchard, an apple orchard, a vineyard and a persimmon orchard, etc. In addition to greens and flowers, visitors can admire other ancient buildings. 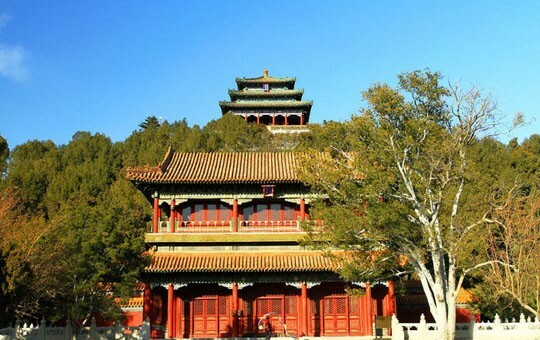 With a building area of 201.92 square meters, the Qiwang Building (绮望楼) is located at the foot of Qianshan Mountain, facing the south gate of Jingshan. In ancient China, the emperors often asked the civil and military officials, tribal leaders and ministers from all over the country to enjoy a banquet in the building. If you are planning to visit Jingshan Park for photography purposes, the best time to visit is at sunrise or at sunset. The best months to visit are from March to May and from September to November. There are several buses passing by Jingshan Park. Therefore, there are several options. Take Bus 101, 103, 109, 124, 68, 111, and Bus 58 to the Stop of Forbidden City (故宫站), the Stop of East Gate of Jingshan (景山东门站) or the Stop of Xiban Bridge (西板桥站) . Then, walk to the park. As at 4th September 2018, the entrance pricing is 2 CNY per person; children under 1.2m tall (1.2m tall not included) are charged 1 CNY per person; the elder above 70 years old (70 years old included) are charged 1 CNY per person. In spring when there is peony show and tulip flower show, the entrance pricing is 10 CNY per person; children under 1.2m tall (1.2m tall not included) are charged 5 CNY per person; the elder above 70 years old (70 years old included) are charged 5 CNY per person. You also could refresh yourself at one of the restaurants or cafes in the park. The park offers the charged strollers, umbrellas, and wheelchairs rental service. Interested in visiting the Jingshan Park on a Tour? Wendy Wei Tours offers a variety of different packaged tours as well as custom tours including the Jingshan Park, among other attractions and destinations. To find out more, please visit our Tours page or Contact Us directly to find out more.